Conner is a 12-year-old golden retriever mix with difficulty standing and left pelvic limb lameness. His owners became concerned that his quality of life was poor after treatment with pain medication did not yield improvement, and he was referred for acupuncture. Myofascial exam yielded evidence of thoracolumbar pain and dysfunction that was severe. Also, he had myofascial dysfunction of his neck and hips. Three weekly integrative medicine sessions were recommended; these sessions included acupuncture, massage and laser therapy. Over the course of treatment, Conner improved from his owners using a sling to support him to going on walks and jumping over logs. His owners reported that he became more agile and comfortable at home. 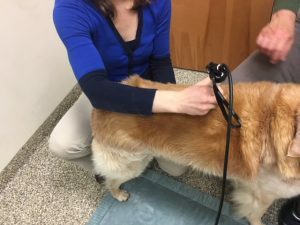 Connor is a 12-year-old 55-lb castrated male Golden Retriever Mix that presented for intermittent lameness of the left pelvic limb and difficulty rising. His owners have been supporting his hind end with a towel. He does not seem to want them to touch his back or hind-end. No history of trauma, prior surgery, or injury was documented. He was receiving Tramadol and Gabapentin for suspected coxofemoral osteoarthritis. He received laser therapy on both hips, and he was referred for acupuncture. Connor has a history of inflammatory bowel disease (IBD), chronic hepatitis, and atopy. Blood work performed in February 2017 revealed normal liver enzyme levels and normal liver function parameters. Conner was found to be bright, alert and responsive; though nervous. His body condition score is 5/9. His gums were pink and moist. His respiratory pattern was normal and thoracic auscultation of his heart and lungs are found to be normal. His abdomen was soft and compliant. No lameness was detected, though he appeared stiff in his pelvic limbs. He was reluctant to extend both coxofemoral joints. Neurologic exam was performed and no cranial nerve deficits were detected. Conscious proprioception was found to be normal in all four limbs, patellar reflexes were normal, and no cross-extensor reflex was present (bilateral). On myofascial exam, he was found to have muscle atrophy of the semitendinosus muscles (mm. ), semimembranosus mm., and gluteal mm. There was significant heat palpated over his thoracolumbar spinal region (TL region) and hypertonic paraspinal muscles from T11-L3; he flinched and dropped his hind-end when I ran a flat hand gently over this area. Exam of the pelvic limbs revealed bilateral hypertonic musculature including: rectus femoris mm., sartorius mm., lateral and medial quadriceps mm. Myofascial assessment of the thoracic limbs, and cervical area revealed taut trapezius pars cervicalis mm., trapezius pars thoracica mm., latissimus dorsi mm., caudal cervical paraspinal mm, deltoid mm. and triceps mm. Connor’s left triceps major m. had a firm, knot-like area that was interpreted to be a trigger point. Radiographs of the spine and pelvic limbs were obtained. Spondylosis deformans was present from T13-L4. Bilateral coxofemoral degenerative joint disease was present with the right hip more severely affected. There was mild effusion of the left stifle; this finding was absent in the right stifle. There was no evidence of cranial cruciate disease on exam such as a cranial drawer sign, though Connor was not sedated for more thorough evaluation of this finding. 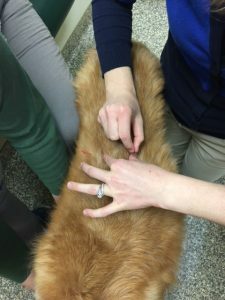 Following examination of Conner, it was determined that he had discomfort of his coxofemoral joints and bilateral myofascial dysfunction in the following areas: cervical, scapular, caudal brachium, thoracolumbar, cranial thigh and gluteal areas. The TL region was treated as a priority in the first session due to the severity of his pain. The strategy implemented was to create neuromodulation of the pain state by choosing central points corresponding to each region, as well as, specific central points that lead to release of endorphins. Peripheral points were elected to create neuromodulation of pain at the site of myofascial dysfunction by means of the gait theory. Trigger points were addressed with dry needling, as needed. Autonomic points were implemented in his second and third session to address a flare of his inflammatory bowel disease. The goal in modulating this system was to balance upregulation of the sympathetic nervous system caused by windup. Following acupuncture, effleurage of the treatment areas was performed to reassess the myofascia and increase blood flow and lymphatics. Laser therapy was performed last to improve cellular metabolism and blood flow to diseased tissue. Based on exam findings, as well as radiographic imaging, a diagnosis of coxofemoral arthritis and degenerative disc disease with compensatory myofascial dysfunction was made. Conner likely has a partial tear of his left cranial cruciate ligament due to mild effusion noted on radiographs. The limitation of the radiographic imaging in detection of spinal cord disease does not completely rule out disease of this tissue, nor was cerebrospinal fluid evaluated. However, the lack of abnormal findings on the neurologic exam was thought to make a disease targeting this tissue unlikely. Thoracolumbar myofascial dysfunction may also be the result of disease of an internal organ, through viscerosomatic mechanisms. The area affected (T11-L3) may be due to disease of the liver, gallbladder, spleen, digestive tract, adrenal glands, or kidney. Connor does have a history of chronic hepatitis and IBD. Additional bloodwork and imaging were not performed. Cervical myofascial dysfunction was found to less severe and compensatory. Connor received three acupuncture treatments, one week apart. Seirin No.1 (0.16) x 15 mm were used during all sessions. Electrical acupuncture was not utilized because a unit was not available. The first session focused on the severe thoracolumbar pain and dysfunction. “Friendly points” were placed first with the goal of endorphin release and relaxation. The points included were GV 20, GV 14, and Bai Hui. Then, points on the inner and outer bladder line were selected from T11- L4 (BL 19-24 and BL 48-53), as well as, GV 4. The inner and outer bladder line points served as peripheral points for this area and GV 4 as a central point. While these needles remained in place, peripheral points affecting the hip joint were placed including BL 54, GB 29 and GB 30 with Bai hui serving as a central point. The last area addressed was the cervical area and shoulders. SI 11 and SI 12 were placed bilaterally and a trigger point was addressed in the left triceps that was tender to palpation. This trigger point was treated using a Seirin No.1 (0.16) x 15 mm. The treatment was followed with gentle effleurage of the affected areas with each session, which allowed reassessment his pain and the mayofascial dysfuction. I followed the massage with laser therapy of all the affected regions, using a Companion Class IV laser (980/810 nm) on manufacturer’s setting for arthritis. I decreased the power to 2 Watts and a total of 870 joules was delivered, continuous. Conner’s owner reported at the second session that he was more comfortable, no longer flinching with his hind-end, and having a flare of his inflammatory bowel disease. Myofascial exam yielded significant improvement in the dysfunction of the TL region. Connor’s shoulders and neck once again remained taut, though improved, and his cranial thighs were taut but no sensitivity was detected. The second treatment was similar to the first, including friendly points (GV 20, GV 14, Bai hui), bladder line points in the TL region (though fewer were placed based on palpation), hip points (BL 54, GB 29, GB30) and shoulder points (SI 11 and SI 12). During the second session a trigger point was palpated in the right dorsolateral lateral quadriceps muscle belly and this was treated via dry-needling technique using a Seirin 0.1 (0.16 x 15 mm) needle. Also, ST 36 was placed to modulate the autonomic nervous system in an effort to address his IBD flare. The mild dysfunction in the cervical region (as well as all other affected regions) was treated with laser therapy and massage. The Companion Class IV laser was used with a max of 2 Watts power for a total of 890 joules delivered. Connor’s owner reported at the third session that he was even more agile. The findings on myofascial exam included overall less myofascial restriction and tenderness to palpation. He was tender to palpation of his medial and lateral quadriceps muscles, which I attributed to his increase in activity on walks. “Friendly” points were placed first followed by more of a focus on his pelvic limbs. BL 54, GB 29, GB 30, ST34 and SP 10 were utilized for this purpose. Also, ST 34 and SP 10 were placed on the left to affect the mild stifle effusion. This area was treated in an attempt to proactively address stifle discomfort with Connor’s increased activity. Autonomic points were placed, including ST 36 and SP 6 to neuromodulate the autonomic system due to continued mild diarrhea. The cervical area, brachia, pelvic limbs, and TL region was treated with laser therapy at the end of the treatment session. The Companion Class IV laser was used with a max of 2.5 Watts power for a total of 790 joules delivered. 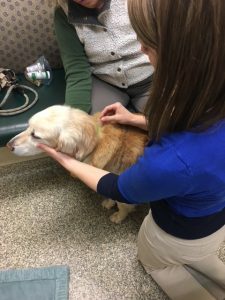 The integrative treatments performed led to gradual clinical improvement of Conner’s pain and function; based on observations made on follow-up exams, performed with each visit, and owner reporting. Connor’s owner reported at his second acupuncture session that they no longer needed to support him to stand or walk using a sling. He began to jump on the couch, a common behavior that he had ceased to exhibit. My findings at this second visit, were that the significant myofascial restriction in his TL region remained improved and with minimal recurrence. Dissimilar to his initial myofascial exam, he does not immediately flinch and go down in his back end when I ran my hand over this area. His thigh muscles remained hypertonic and these areas were addressed. Connor’s owner reported continued improvement at home at the time of his third visit, including a return to trail walks. During one of these walks he leaped over a fallen log. Examination found that his TL region remained improved. His sartorius and quadriceps mm. remained sensitive and with gentle palpation of this site he licked his lips and moved and moved away. This finding is consistent with increased activity with underlying osteoarthritis. Therefore, it was determined that continued bi-weekly treatments should be continued. The other therapies that Connor was receiving (Gabapentin and Tramadol) remained unchanged during the three weeks of integrative medicine treatments. His weekly improvement was, therefore, interpreted to be the result of acupuncture and laser therapy. Acupuncture led to improvement by the release of endogenous opioids and endorphins. Also, the peripheral points likely decreased pain perception by neuromodulation via creation of a non-noxious stimulus thus creating cutaneous, post-synaptic input to the spinal cord thereby blocking (or dampening) input of a noxious stimulus (1). Acupuncture also contributed to healing by increasing blood supply to diseased tissue. This occurred due to vasodilation created as a result of needle insertion. Needle insertion leads to interactions with local vasculature and also activation of mast cells that lead to vasodilation via histamine release (2). Histamine and serotonin released by mast cells also likely has a neuromodulatory effect on local nerve pathways. Improved perfusion of tissue results in improved tissue health, healing and function. Similarly, laser therapy increases blood flow to the site of treatment, but more importantly improves cellular metabolism via the interaction of photo energy with the electron transport chain of mitochondria. Thus, leading to increased production of ATP and increased transcription of DNA that leads to improved cellular activity, modulation of reactive oxygen species, and therefore healing (3). Connor’s case further informed my leaning experience by allowing sequential observations of the effect integrative techniques had on the patient. Previously, I would have managed his case by obtaining radiographs and placing him on pain medication, thereby overlooking the severe myofascial dysfunction that accompanied his diseases. 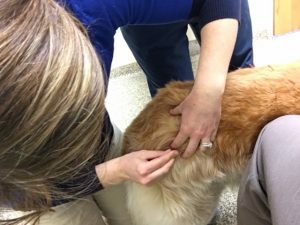 Traditional treatment was not yielding an effect on his myofascial dysfunction, and acupuncture and laser therapy quickly led to dramatic improvement and a very happy dog and owner. The clinical implication of being able to affectively perform a myofascial exam, and implement an acupuncture plan, is that fewer patients will go under-diagnosed and obtain the treatments that they need. (1) Mendell, Lorne M. “Constructing and Deconstructing the Gait Theory of Pain” Pain. 2014 Feb; 155(2): 210-216. (3) Hamblin MR, Demidova TN. “Mechanisms of low level light therapy” Proc. Of SPIE Photonics, 2006: 6140: 614001-01-12.